Twelve Fijian medical personnel who are in Vanuatu for relief efforts have been making life-saving impacts in the cyclone ravaged island of Tanna. Since their arrival, they have conducted emergency surgeries, delivered new born babies, treated emergency and out patients, and held community health visits. Classified as level one, the medical team is able to provide the highest level of surgical treatment to trauma patients. Chief medical officer Dr Luke Nasedra, said the team had made an impact and local communities had been happy and accommodative. “Most of the cases admitted in Lenakel Hospital where we are stationed are mostly children with pneumonia following the cyclone. Adults have also come with many infected wounds,” he said. Dr Nasedra said: “For surgery we had boils and wounded infections for cleaning. We’ve also had one appendix operation. 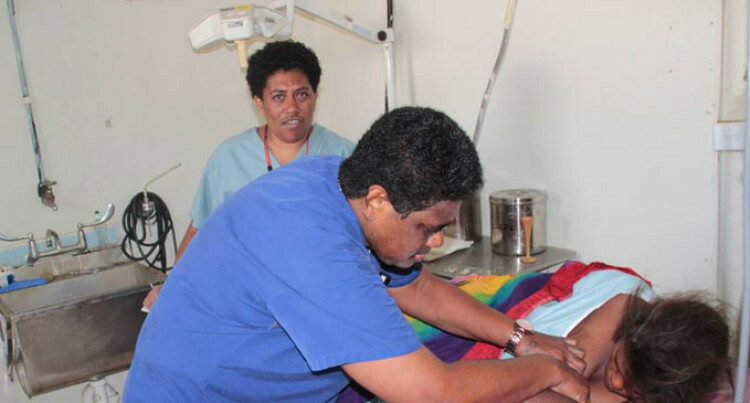 “Some women have come in for deliveries and the two midwives from Fiji are doing exceptionally well with eight normal births so far,” he said. A group of public health inspectors has also been leading public health interventions in communities. Chief health inspector and health national disaster management co-ordinator, Kanito Lovobalavu, said: “We have conducted environmental health audits, food safety inspections, water supply system audits, and general awareness in communities. Mr Lovobalavu also said that the experience was a good opportunity for them. “We struggled to come in but we’ve achieved it and it’s a good opportunity. It’s a good learning experience and we’re going to learn a lot from it,” he said.